Labor's Gotta Play Hardball to Win! Internationalist contingent in protest outside I.C.E. jail in Manhattan on February 26 "day without immigrants." New York City is a union town, where a quarter of all workers are members of a labor union. New York City is an immigrant town, where over 40% of the entire population was born in another country. We have enormous potential power. Workers – black and white, Latino and Asian, Muslim and Jewish, born here or abroad – make every wheel turn. Nothing moves without our labor. But now we are all being targeted by outright fascists and violent race-hate groups of the “alt right,” who have announced they will hold a vicious Muslim-bashing action on June 10 at Foley Square in Lower Manhattan. They claim the purpose is to oppose the imposition of “sharia law,” an entirely made-up threat. The real and obvious purpose of this “dog whistle” is to attack all Muslims. As recent events show all too clearly, this is a real and present danger to all working people. 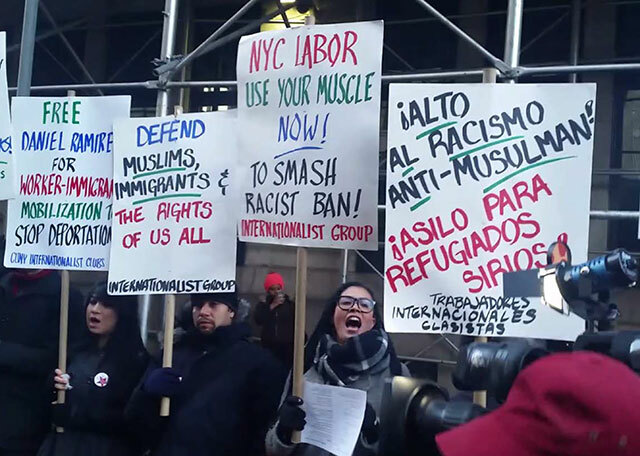 It is crucial to bring out the power of New York’s multiracial working class and opponents of racist, anti-immigrant bigotry, to shut down the fascists and their June 10 provocation. On May 13, “alt-right” fascist leader Richard Spencer led a mob of hundreds rallying to “save Confederate monuments” in Charlottesville, Virginia. Imitating the German Nazis, they marched with flaming torches, while waving the Confederate battle flag of the slave-owners and KKK. A week later, on May 20, African American student Richard Collins was murdered by an “alt-right” fascist at the University of Maryland, in what has widely been described as a lynching. On May 25, nooses – a threat of lynching – were found at one of the main terminals in the Port of Oakland in California. 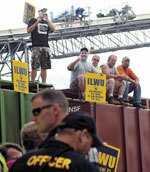 ILWU longshoremen walked off the job in protest. On the same day in New York, racists including Islamophobe Pamela Geller, immigrant-bashing provocateur Milo Yiannopoulos and fascists wearing body armor and helmets staged a rally against CUNY for allowing well-known Arab American rights activist Linda Sarsour to give a commencement speech. The fascists violently assaulted counter-protesters. On May 26, less than a month after a race-hate rally was held in Portland, Oregon, a fascist who had prominently attended it murdered two men and seriously injured a third for standing up to him as he screamed anti-Muslim insults and death threats against two young women on a train. NYC’s powerful labor movement must not stand by while fascists try to bring their racist terror to our town. Fascists are the deadly enemies of the working class. They would smash the unions and pave the way for an unfettered corporate dictatorship. They seek to obliterate the most basic rights of everyone opposed to racism, of women, gays and lesbians, of students and youth. They are a threat to us all. The city government and Democratic Party won’t stop them. Democratic mayor De Blasio has declared 170 “deportable offenses” for which NYC will collaborate with I.C.E. immigration police. He is opposing City Council bills to widen “sanctuary city” limits on cooperation with the I.C.E. His “broken windows” policy causes the arrest of over 100,000 people a year, setting up thousands of immigrants for deportation. And the NYPD alerts I.C.E. about immigrants’ court appearances. The fascists, Muslim-bashers and anti-immigrant racists feel they have a green light for terror with Republican Donald Trump in the White House. But don’t forget that Democratic president Obama deported over 5 million immigrants (8 million if you include those stopped at or near the border), a record number. In Portland, Oregon, eight area unions, including several construction workers unions, the Carpenters regional council and statewide teachers federation, have passed motions calling to bring out labor against the threat of reactionary racist forces. This coming June 4, Portland labor activists are mobilizing to stop a fascist provocation only nine days after last week’s double murder. That should spur NYC labor to use its power to shut down the June 10 Muslim-bashing event. Already in February, Teamsters Joint Council 16 set an important example when it demonstrated at JFK airport in defense of Muslims. The Taxi Workers Alliance shut down airport service to protest Trump’s Muslim ban. In strikes and organizing drives from Verizon and Spectrum Cable to B&H Photo and AT&T Mobility, NYC workers have fought back in defense of our rights.